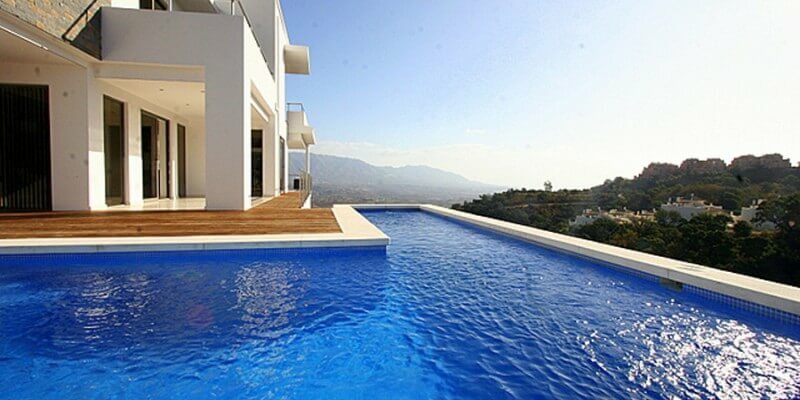 Very exclusive villa Marbella on a hillside in the mountains high above Marbella. The challenge for every architect was this property, a kind of mountain dome with steeply sloping edges to each side. How do we combine the difference in height of 15m with comfortable living space including pool? bühler & partners mrics architects, surveyors, valuations are experts when it comes to hillside situations: it is certainly more cost-intensive for the client, because at the same time slope means more concrete, more excavation, more material and more work. A hillside situation also partly necessitates an elevator, which makes a simple access from basement to kitchen on the ground floor or even penthouse comfortably. This kind of land is also cheaper, in the ideal case it compensates in the end. Sloped plots, however, secure a decisive advantage: unobstructed view and exclusivity, ideally combined with visual protection from all sides. For where no neighbor is, no one can see. This villa combines all this. 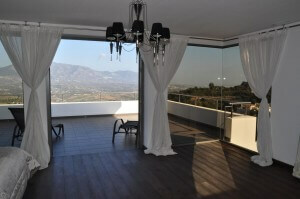 Exclusivity, privacy, unobstructed view of the rugged mountain world of the Sierra de las Nieves as well as the sea. Even the thickly snow-covered Sierra Nevada can be seen with good visibility. Who can call himself the owner of a villa that combines such luxurious details? Without restrictions, in the villa we planned a nearly circumferential “terrace deck, for the “captain”. For the dream view to the south-east, a folding window in the corner, which can be opened completely at pleasant temperatures. This allows for fluid boundaries in architecture, the exterior is now inside, the landscape is fully integrated. The large folding element – very smart in handling, we were a long time critical opinion of such large folding elements – was a complete success and guaranteed a U-value of 0,6. With our special insulating glass panes, which we install more and more, we guarantee pleasant temperatures in the house even in the summer.